The conference on 'Psychoanalysis, Fascism and Fundamentalism' which produced the papers which this Journal is pleased to publish was an intense,. ground of World War ll, which will be covered in the next chapter. 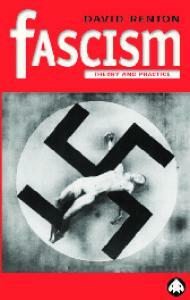 The Doctrine of Fascism. Benito Mussolini. Italy was the ﬁrst European power to turn to fascism. Spain retaliated with economic pressures, and by 1951 Norway had relented ... membership; Diplomatic relations; Trade war; Small state activism; Anti-Fascism. Empire. But the relationship between Japan and the mother country of fascism, ... background of internal mobilization, total war and violence.6 From this per-. spectacle which anti-Fascists would later use against the regime) or leading his ... volumes of poetry to elaborating a role for creative writers in Fascist Italy:. Himka for allowing him to read his un- published manuscripts, to Per Anders. Rudling for his critical and constructive comments and to Michał Młynarz and. • 1861 Italy achieves independence and is unified under the Savoy monarchy. Venice joins the new Kingdom in 1866, Rome in 1870. • 1863 The Politecnico di Milano is founded by a mathematician, Francesco Brioschi. • 1871 The capital is moved from Florence to Rome. • 1880s Colonial period begins (Somalia, Eritrea, Lybia and Dodecanese). • 1908 IV International Congress of Mathematicians held in Rome, presided by Vito Volterra. • 1913 Emigration reaches highest point (more than 872,000 leave Italy). About 75% of the Italian population is illiterate and employed in agriculture. 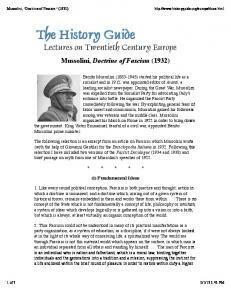 • 1914 Benito Mussolini is expelled from Socialist Party. • 1915 May: Italy enters WWI on the side of the Entente against the Central Powers. More than 650,000 Italian soldiers are killed (1915-1918). Economy is devastated, peace treaty disappointing. • 1921 January: Italian Communist Party founded in Livorno by Antonio Gramsci and other former Socialists. 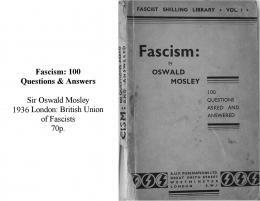 November: National Fascist Party founded in Rome by Mussolini. Strikes and social unrest lead to political instability. • 1922 October: March on Rome. Mussolini named Prime Minister by the King. The Unione Matematica Italiana (UMI) is founded in Bologna by Salvatore Pincherle. • 1923 The Consiglio Nazionale delle Ricerche (CNR) is founded in Rome by Volterra. • 1924 Giacomo Matteotti, a Socialist leader, is kidnapped and murdered. Opposition MPs walk out in protest. • 1925 Mussolini assumes dictatorial powers. Parliament is dissolved, opposition parties outlawed. • 1928 VIII International Congress of Mathematicians is held in Bologna, presided by Pincherle. • 1931 Oath of allegiance to the King and to the Fascist regime imposed on all State employees. • 1938 Manifesto della Razza. Fall: Anti-semitic laws enacted. All students and professors of Jewish descent expelled. Enrico Fermi wins the Nobel Prize for Physics and leaves Italy for the United States. • 1940 Italy enters WWII and forms the Rome-TokyoBerlin Axis with Germany and Japan. The Istituto Nazionale di Alta Matematica (INdAM) is inaugurated in Rome by Francesco Severi. • 1942 Carpet bombing by US warplanes of Italian cities begins. Timeline (cont.) • 1943 July: Mussolini is deposed by the Gran Consiglio and placed under arrest. September: Gen. Badoglio signs Italy’s surrender. Civil war begins between Fascist loyalists and partisans. Mussolini rescued from Gran Sasso prison and taken to Germany. • 1944 The Repubblica Sociale Italiana, a Nazi puppet government headed by Mussolini, is established in Sal` o (Northern Italy). • 1945 April: all of Italy liberated. Mussolini is executed. • 1946 Referendum between Monarchy and Republic. Republican Constitution adopted. Provisional government includes Socialists and Communists. A sweeping amnesty for all but the most notorious Fascist Party members is passed. Reconstruction begins. By the early 1900s, Italy is a mathematical powerhouse, second only to Germany and France. Italy will keep this position for over 20 years. How did this happen? And why mathematics? The ascent of Italian mathematics One simple explanation would be: because mathematics is cheap! Even a poor country can afford it. True, but not enough to explain the meteoric rise of Italian mathematics. Much of the credit goes to three individuals: • Enrico Betti (1823–1892) • Francesco Brioschi (1824–1897) • Felice Casorati (1835-1890) These three friends deliberately set out to build up Italian mathematics. Together they traveled to the European capitals of mathematics (Berlin, G¨ ottingen, Paris) and were in close contact with one of the greatest mathematicians of all times, Bernhard Riemann, who spent long periods in Italy. They founded the Annali di Matematica Pura e Applicata in 1858. Worked on invariant theory, determinants, elliptic functions. His main work was in the theory of functions of a complex variable. One of the greatest mathematicians of all times. Other important figures of this period are Luigi Cremona (1835-1903), founder of the Italian school of algebraic geometry, Eugenio Beltrami (1835-1900), who made lasting contributions to mathematical physics and differential geometry, and Ulisse Dini (1845-1918), an influential analyst and long-time director of the Scuola Normale Superiore in Pisa. These mathematicians created important mathematical schools in Rome, Bologna, Padua, Pavia, Pisa and were in close contact with the leading mathematicians in Germany, France and other European countries. Betti, Beltrami, Cremona and Dini all became senators and played important roles in shaping the higher education system in Italy. Piazza dei Cavalieri, Palazzo della Carovana. Another crucial event in the history of Italian mathematics is the founding of the Circolo Matematico di Palermo in 1884 by Giovanni Battista Guccia (1855-1914). In particular, the Rendiconti del Circolo Matematico di Palermo quickly becomes one of the most important mathematical journals in the world. e, Picard, Many famous mathematicians including Poincar´ Hilbert, Schmidt, Weyl, Dickson, Birkhoff, etc. are members of the Circle and publish in the Rendiconti. By the turn of the century, Italy has reached a leadership positions in many fields of pure and applied mathematics. Several of them are graduates of the Scuola Normale in Pisa. All of them except Ricci, Bianchi and Peano are Jewish. Ricci and Levi-Civita created the mathematical methods later used by Einstein in his Theory of General Relativity. Founder of UMI, his main work was in complex and functional analysis. Made important contributions to analysis and mathematical logic. Full professor of Mathematical Physics at age 23. Senator of the Kingdom and “Mr. Italian Science”. One of the founders of the Italian school of algebraic geometry. Worked in algebraic geometry, history and philosophy of science. Bologna, inner court of the Palazzo dell’Archiginnasio, 1921. One of the most eminent mathematical physicists in the world. The Italian Jewish Community The Italian Jewish community, which has very ancient origins, has alwasy been rather different from that of other European countries. It has always been small (50,000 people at most), highly integrated, strongly involved in commerce and the professions as well as in politics and higher education, with a high percentage of non-practicing members. Jews were also present in the Armed Forces and fought in the Independence Wars against the Austro-Hungarians and later in World War I, many enlisted as volunteers. People like Segre, Volterra, Castelnuovo, Enriques and LeviCivita were deeply imbued with positivistic values. They all saw themselves as liberals and free thinkers. Other sciences Apart from mathematics and mathematical physics, Italian science was rather poorly developed. For the most part chemists, physicists, biologists and medical researchers were not on a level comparable with that attained by mathematicians. In fact, a notable decline had taken place since preunification times, when Italy could boast important physicists and chemists such as Luigi Galvani, Alessandro Volta, Amedeo Avogadro and Stanislao Cannizzaro. A rare exception was Camillo Golgi (1843-1926), the 1906 Nobel laurate for Medicine. Other Italian scientists around 1900 include the physicists Antonio Pacinotti (1841-1912), Augusto Righi (1850-1920) and Quirino Majorana (18711957), the electrical engineer Galileo Ferraris (1847-1897), and the engineer-inventor Guglielmo Marconi (1874-1937), a 1909 Nobel laureate for Physics and the “official face” of Italian science in the Fascist period. Marconi with his invention, the wireless telegraph. Other sciences (cont.) Although these scientists were highly competent, none of them made truly fundamental contributions to modern science. While Physics was being completely revolutionized by men like Ludwig Boltzmann, Max Planck and Albert Einstein, their outlook was still essentially a 19th Century one, based on classical theories of mechanics, heat and electromagnetism. They were mostly experimentalists and were skeptical of the radically new worldviews advanced by theoreticians. As a rule, they rejected Einstein’s relativity and could not grasp the meaning of the quantum revolution. In contrast, the mathematicians were much more open to these new discoveries. The destinies of Italian physics will suddenly change with the appearance on the scene of Enrico Fermi (1901-1954). The great physicist at age 26. Enter Mussolini (cont.) When Mussolini takes over, Italian science is largely dominated by mathematicians. Vito Volterra, who had become a full professor at the age of 23 and a senator at age 46 (in 1906) is known worldwide as Mr. Italian Science. In 1923 Volterra establishes the CNR. 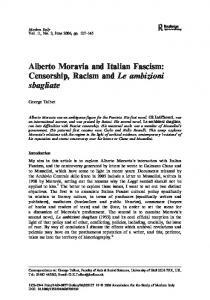 Together with the UMI (founded a year earlier by Pincherle), these two institutions will play an important role during the 1930s in the fascistization of Italian science, after Volterra’s dismissal. By 1922 the Rome science faculty includes Volterra, Castelnuovo, Enriques, Levi-Civita and Francesco Severi (18791961), a former student of Segre and a leading algebraic geometer. Another prominent mathematician, the analyst Mauro Picone (1885-1977), will move from Naples to Rome in 1932. There he will build up the INAC, the first research center in the world devoted to computational mathematics. Enter Mussolini (cont.) Rome University, as one of the main centers of mathematical activity, attracts foreign students and post-docs including people of the caliber of Oscar Zariski (1899-1986), Dirk Struik (1894-2000), and many others. In 1927, at age 26, Enrico Fermi, supported by the Roman mathematicians (especially Castelnuovo and Levi-Civita) becomes a full professor at the university of Rome and almost immediately proceeds to build the famous but short-lived school of via Panisperna. At this time, early signs of anti-semitism begin to appear within the scientific community, in part due to resentment for the power wielded by the tightly knit group of Roman mathematicians. Advised by Enriques, around 1925 Ascher Zaritsky changes his name to Oscar Zariski. Studied in Rome with Castelnuovo and Enriques. Enter Mussolini (cont.) By the mid-1920’s, political events begin to affect mathematicians. Volterra leads a valiant battle against Fascism in the Senate, and is among the so-called Aventiniani after the Fascists murdered Giacomo Matteotti, a Socialist leader, in 1924. Severi, a Socialist at the time, resignes in protest from his post as Rector of the University of Rome. In 1923 the philosopher Giovanni Gentile joins the Fascist party and is promptly appointed Minister of Education. 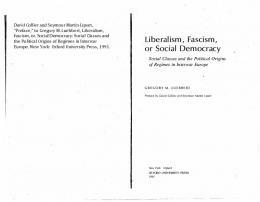 In 1925 Gentile and others issue the Manifesto degli intellettuali del Fascismo. It is answered immediately by a counter-Manifesto written by Benedetto Croce and signed by many of the leading Italian mathematicians including Volterra, Levi-Civita, Castelnuovo, Severi as well as by Beppo Levi, Leonida Tonelli, and others. 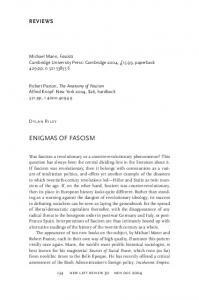 The leading Fascist intellectual and philosopher. The leading anti-Fascist intellectual and philosopher. Enter Mussolini (cont.) The 1928 International Mathematical Congress was held in Bologna. It has sometimes been described as “the funeral of Italian mathematics,” which was then beginning to show the first symptoms of a deep crisis. In retrospect, it is clear that the leading Italian researchers had by then begun to decline and that their replacements, while generally very good, were not quite at the same level as the old masters. Moreover, some important new fields of research were being virtually ignored. Among these we mention abstract algebra and topology, which were rapidly developing in Germany but also in the emerging mathematical community of the United States as well as in Poland and the Soviet Union. The Oath In the 1930s the regime’s grip on every aspect of Italian life becomes stronger and stronger. In 1931 Severi convinces Gentile to demand of all university professors an oath of allegiance to the King and to the Fascist regime. Until then, unlike other State employees, university professors had been exempt from taking any oath. In all, only 20 professors and academicians (out of approximately 1200) refuse to take the oath and are forced to resign; among them Volterra, who is wealthy and moves to France in a self-imposed exile. Other professors with antifascist leanings, including LeviCivita, attempt to use their connections to find a way out but in the end they have to cave in in order to keep their job. By 1930, Italian mathematics is effectively in the hands of two men: Severi, who by then has set aside his initial opposition to the Fascist regime, and Picone, who has been a convinced Fascist since the very beginning. A year earlier the venerable but politically unreliable Accademia dei Lincei has been disbanded and replaced by the more pliable Accademia d’Italia; scientists loyal to the Fascist regime are rewarded with a seat in it, and the huge perks and power that go with it. Severi is among the first to attain membership and, with it, the title of Sua Eccellenza; Fermi is another one. Godfather of Italian pure mathematics in the 1930s. As a student at the Scuola Normale in Pisa. Founder of an important school of mathematical analysis. Severi and Picone represented the two souls of Italian mathematics: the “pure” and the “applied” one. Severi insisted on the intrinsic value of mathematical thought (regardless of its possible applications) and elected himself to the role of defender of the Italian school of algebraic geometry, its methods, and results, which were being strongly criticized by foreign mathematicians. Picone was eager to put mathematics to work at the service of society and to increase the industrial and military strength of the country. His own work was mostly in analysis. He was fond of saying Applied Mathematics = Fascist Mathematics! Picone’s interest in effective methods of solution of differential equations originated from his service as an artillery officer in WWI. The Godfathers: Severi and Picone (cont.) The importance of Picone lies primarily in his institutional role, his vision, and his school, which was to lead the recovery of Italian mathematics after WWII. Because of his openness to new currents of thought, he proved instrumental to the survival of mathematical analysis research in Italy. Picone trained many young mathematicians who would later be famous, including Renato Caccioppoli, Lamberto Cesari, Giuseppe Scorza Dragoni, Gianfranco Cimmino, Carlo Miranda, Gaetano Fichera and, after WWII, Ennio De Giorgi. The most famous of these was Renato Caccioppoli (1904-1959), who acted as a bridge between the pre- and post-war generations. His life (and death) was dramatic enough to make him the subject of several books and a remarkable 1992 movie by Mario Martone, Morte di un matematico napoletano, casting Carlo Cecchi as Caccioppoli. A brilliant mathematician and a courageous antifascist. Actor Carlo Cecchi in the role of Caccioppoli. Severi yielded even greater power and influence than Picone, to whom he was superior as a mathematician. Severi’s international fame was such that on a conference tour of Japan in 1937 he was received by the Emperor. At the end of his life, he belonged to 26 scientific academies worldwide. Severi had direct access to Mussolini. He used his influence to exert complete control on every aspect of mathematical life in Italy: competitions for university positions, editorial boards of major journals, publications and translations of books, conferences, educational policy, etc. In 1940 Severi inaugurated the Istituto Nazionale di Alta Matematica (INdAM) in Rome, with Mussolini and Italy’s Minister of Education, Giuseppe Bottai, in attendance. Rapid decline In the 1930s Italian mathematics enters a deep crisis. The causes of this decline are both internal to the various disciplines and external. In some areas, like analysis and mathematical physics, activity remains at a decent level, but far from the past glories. In other fields, like algebraic geometry, despite the presence of excellent researchers the Italian school is no longer able to keep up with modern developments, which are often dismissed as “fads”. Italian mathematics is becoming increasingly provincial. Young researchers could jeopardize their career if they tried to keep up with contemporary trends abroad. In contrast, during the 1930s Italian Physics enjoys increasing international prestige thanks to the work of Fermi and his group. D’Agostino, Segr` e, Amaldi, Rasetti and Fermi, via Panisperna. Rapid decline (cont.) Among the external factors, it should be kept in mind that in the 1930s Italy becomes increasingly isolated (economically, politically and culturally) as a result of the colonial campaigns in Africa and the consequent economic sanctions. Travel, visitors, conferences, journal subscriptions become more and more problematic. The so-called Autarchia is enforced. The rigid hierarchical organization of society (including universities) does not encourage innovative, independent work on the part of the new generations being formed. A sterile rivendication of Italy’s “leadership” in mathematics (by now a fading memory) replaces honest confrontation with the stimuli coming from other, more advanced nations. Day of infamy (cont.) In the Fall of 1938, under pressure from Hitler, Mussolini’s regime approves a set of anti-Semitic laws. The effect of these measures is to exclude Jews from virtually all aspects of Italian life. The ground has been prepared by extensive anti-Jewish propaganda on the political front, and by the infamous Manifesto della Razza on the ideological front. This document is drafted by a group of medical researchers, zoologists, anthropologists and other self-styled scientists. Two prominent academics, Nicola Pende (1880-1970) and Sabato Visco (1888-1971), are among the authors. The Manifesto was endorsed by the powerful Propaganda Ministry (MINCULPOP). Day of infamy (cont.) The Manifesto stated the existence of a pure Italic race (belonging to the Aryan family) and the need to defend its purity from contamination by “extra-European races.” One of the immediate effects is the dismissal of nearly all professors, teachers, and students of Jewish heritage from all schools, at all levels. Among mathematicians, Castelnuovo, Enriques, Levi-Civita, Fubini, B. Levi, G. Ascoli, G. Fano, A. Terracini and B. Segre are ousted from their positions and from the editorial boards of journals. Castelnuovo helps organize and direct the clandestine “Jewish university.” He and Enriques spend the war years in Rome, hidden by friends. Others emigrate to the US, the UK, Switzerland, Argentina, etc. Day of infamy (cont.) The response of the official body of Italian mathematicians, the UMI comes on December 10, 1938. This is the darkest day in the society’s entire history. The UMI issues a statement according to which the “departure” of “mathematicians of Jewish race” has had a minimal impact on the status and health of Italian mathematics. Moreover, the document expresses concern that the university chairs that have just become vacant could be redirected to other disciplines, something to be avoided at all costs. For the next few years, several members of the UMI will devote themselves to rewriting the history of Italian mathematics in a way that minimized (and indeed, erased) the contributions of Jewish mathematicians. Some mathematicians seize the opportunity to settle the score against their colleagues. Severi takes full advantage of the situation to harass Enriques, his ancient teacher and collaborator, with whom he has clashed for personal and scientific reasons in the previous years. He forbids him from entering the Mathematical Institute at the University of Rome, of which he is now Director. Severi also obtains the withdrawal of the geometry textbook by Enriques and U. Amaldi, adopted in all Italian high schools, and its replacement with his own textbook, a very lucrative move! Day of infamy (cont.) The impact of anti-Semitic law is even worse on Italian Physics and Biology, which are devastated. Of Fermi’s collaborators, only Edoardo Amaldi decides to stay. By 1939 Fermi (whose wife Laura was Jewish), Emilio Segr` e (Nobel Prize 1959), Franco Rasetti, Bruno Rossi, Eugenio Fubini, Ugo Fano, Giulio Racah, Leo Pincherle, Sergio De Benedetti and Bruno Pontecorvo have left Italy. Also, Ettore Majorana mysteriously disappears in 1938. e and Rossi work at Los Alamos on During WWII Fermi, Segr` the atom bomb, as part of the Manhattan Project. Among biologists, Italy loses two future Nobel prizes: Salvatore Luria and Rita Levi Montalcini, both students of Giuseppe Levi (the father of the writer Natalia Ginzburg) in Turin. The theoretical physicist as a student in Florence. Commemorative stamp, Israel. Racah co-founded the Hebrew University. Pontecorvo eventually emigrated to the Soviet Union. The effect of Nazism on German science It is natural to compare the situation in Italy with that of other nations, especially Germany. During the Weimar years, Germany had achieved a position of absolute excellence in mathematics and physics, particularly in the universities of G¨ ottingen, M¨ unich and Berlin. All this came to an abrupt end in 1933, with the advent of Hitler. However a few scientists, like Einstein and John von Neumann, had moved to the US as early as 1930. The Nazi virtually destroyed German science. Nearly all the leading mathematicians and physicists were forced or decided to leave. The vast majority emigrated to the US, enormously benefitting American science, which was already on the rise on its own. Also, the flourishing Polish and Hungarian mathematical schools were completely wiped out by the Nazi invasion, with many prominent scientists murdered or sent to concentration camps. Father of the computer, one of the greatest scientists of the 20th century. Founder of the American school of applied mathematics. Founder of the German school of abstract algebra. Stan Ulam, Richard Feynman and von Neumann after a hike, ca. 1950. Enrico Fermi, Peter Lax and others hiking in New Mexico. The aftermath: amnesty or amnesia? After the fateful date of 8 September 1943 a number of mathematicians, including some who had been active in Fascist politics, join the Resistenza and fight against the NaziFascists oppressors. Leonida Tonelli, the Director of the Scuola Normale in Pisa, is among them. The logician Ludovico Geymonat (1908-1991) commands a Brigata Garibaldi in the North of Italy. Another partisan, the mathematical physicist Antonio Pignedoli (1918-1989), is elected to the Assemblea Costituente in 1946. A few others, like Fabio Conforto (1909-1954), remain loyal to Mussolini and fight against the Allied forces after their landing in Sicily. Giovanni Gentile is executed by partisans in Florence in 1944. About 7,000 Italian Jews perish in the Holocaust. The aftermath: amnesty or amnesia? (cont.) Shortly after the war, the new (democratic) government, with the support of the powerful Communist leader Palmiro Togliatti, passed a sweeping amnesty that pardoned virtually all of the people who had been compromised through their association with the Fascist regime. This pardon led to a swift reinstatement of many academics in the posts they held before and during the war. This is true even of the infamous Nicola Pende and Sabato Visco, the primary authors of the Manifesto della razza. Severi, who narrowly escaped lynching at the hand of his fellow citizens of Arezzo in 1944, returned to his university chair in Rome and to the direction of the INdAM, which was named for him after his death in 1961. Likewise, the INAC was named after Picone on the occasion of his 90th birthday in 1975. Concluding remarks It is not always true that the presence of a totalitarian regime discourages science. In the Soviet Union, for example, mathematics and physics were greatly developed. Biology, on the other hand, was more susceptible to the effects of ideology and was nearly destroyed. It has still to recover. In Italy, the effect of Fascism on mathematics was to accelerate an already latent decline. This was mostly due to the presence of a rigidly hierarchical research organization, with most academic power concentrated in very few hands. A result of this centralization was the degeneration of glorious scientific schools and traditions into provincial, cliquish groups centered around a dominant figure and closed, even hostile, to external influences. In addition, racial laws forced a number of brilliant scientists to quit Italy. This was especially devastating for physics and biology. Mathematics also suffered, though perhaps less. Selected readings 1. AA. VV., La matematica italiana dopo l’unit` a. Gli anni tra le due guerre mondiali. Marcos y Marcos, Milano, 1998. 2. AA. VV., La matematica italiana tra le due guerre mondiali. Atti del Convegno, Milano e Gargnano del Garda, 8–11 Ottobre 1986. Pitagora, Bologna, 1987. 3. U. Bottazzini, Va’ Pensiero. Immagini della matematica nell’Italia dell’Ottocento. Il Mulino, Bologna, 1994. 4. A. Guerraggio e P. Nastasi, Gentile e i matematici italiani. Lettere 1907-1943. Universale Bollati Boringhieri, Torino, 1993. 5. —, Matematica in camicia nera. Il regime e gli scienziati. Mondadori, Milano, 2005. 6. G. Israel e P. Nastasi, Scienza e razza nell’Italia fascista. Il Mulino, Bologna, 1998. 7. D. Mirri e S. Arieti (Eds. ), La cattedra negata. Dal giuramento di fedelt` a al fascismo alle leggi razziali nell’Universit` a di Bologna. CLUEB, Bologna, 2002.